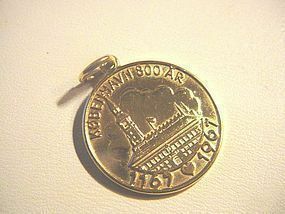 A solid gold coin charm marking the 800th anniversary of the founding of Copenhagen. The obverse is marked Kobenhavn 800AR; the reverse, 585 HMH (Henrik Munck Hansen 1959-1969 ). Measures 3/4" round and weighs 4.7grams.Light wear.